Like any modern young woman, Dorah has laser treatment under her arms (2012, 2014) to allow her to wear pretty dresses. We were referred to Skin Renewal in Parkhurst by several surgeons. It has provided many medical-aesthetic procedures for different burns survivors including carboxy skin softening through infusing carbon dioxide just beneath the skins surface where increased blood flow stimulates collagen; needling and medical tattooing e.g. where there's light pink patch of damaged skin in the middles of a dark cheek, the tattooing can make it almost invisible. None of those techniques have been appropriate or needed for Dorah but for the underarms the skilled professionals pre-numb the skin so that there is no pain at all. Dorah loves the gentle caring atmosphere when she gets the chance to visit, including drinking iced lemon water in the elegant waiting area. Dorah having saline injected into her tissue expander on 10th July 2012 during one period of tissue expansion. 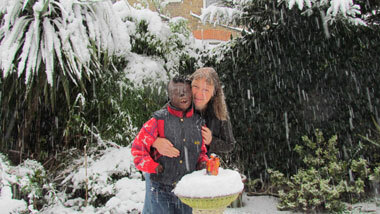 Dorah and her mother in the snow, in Twickenham in December 2010. 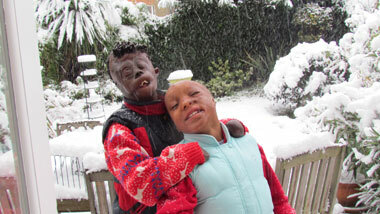 Sizwe and Dorah in the snow, December 2010, before embarking on a (Children of Fire originated) Christmas candle safety campaign with the London Fire Commissioner. Dorah was decidedly grubby after playing in the school garden, September 2006. 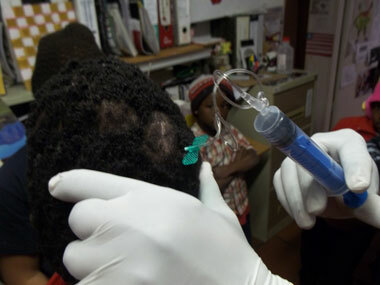 Dorah had a tissue expander in her scalp in late 2009 which was removed ten days after it leaked. Topical antibiotics on the stitches, after bandage kept falling off. Into the Lion's Den: visiting South African Cabinet Ministers in Pretoria with Sicelo, Feleng and Michele, after Gauteng's Dr Rahman undid more than eight months of planning for Swiss surgeons to operate on paediatric burns survivors with calvarial defects and other complex injuries and to skills share with local surgeons. OstPreussen Advents Feier; der Weihnachtsman bringt Geschenke für Lorbas und Marjelchellen. Ein wichtiger Teil der Kultur Dorah, Sizwe und Tristan, jedes Jahr in Johannesburg. 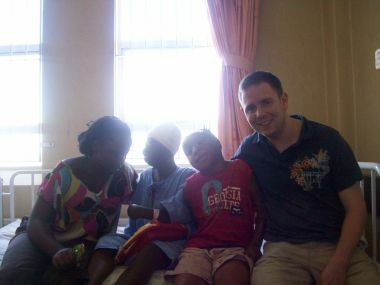 Oliver Kilvert visited Dorah with little Sizwe in Baragwanath Hospital. He has been her friend since 2006. Swinging gives Dorah enormous pleasure and is a vital form of exercise and stimulation every day, moving fluids around her brain to mimic the movements of her more-active sighted peers. Lavender and other scented plants are important for Dorah's sense of well being. 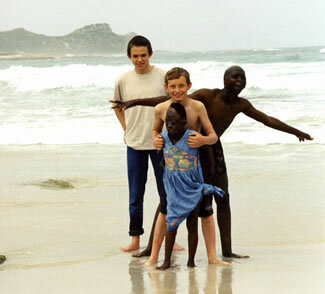 At the southernmost tip of Africa with her big brother Tristan, burns survivor Christopher and Anna's son. Dorah will be 25 years old on 12th April 2019. 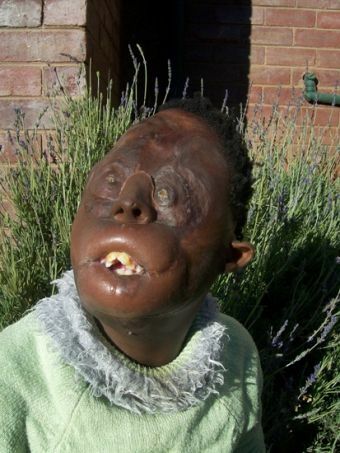 This little South African girl was severely burned in a squatter camp fire at the age of six-and-a-half months. She was turned away from three hospitals as they were convinced that she was about to die. Because of the severity of the fire and because of the delay in getting appropriate treatment, Dorah lost her nose, eyelids, lips, bone in her forehead and hands. Fingers fell off one by one. Her ears were deformed by the flames. She had a badly scarred chest that, as with many other burned girls, was expected to develop unevenly during puberty. Like all burns survivors, she has the rectangular scars where surgeons have borrowed tissue to repair other areas. Her biological mother Margaret abandoned her for more than three years but was reunited with her daughter for some two years, following strenuous endeavours by trustee Bronwen Jones and her family and, later, a lot of support in Britain. 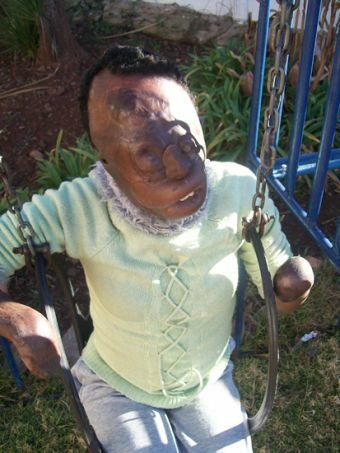 Margaret abandoned her daughter again upon their return to South Africa in 2000. Dorah's early years were spent almost entirely cot-bound. Nonetheless she had several friends who visited her regularly: a young boy Tristan, his mother, and his friend Thobeka. They tried to ensure that Dorah knew the pleasure of childhood friends. 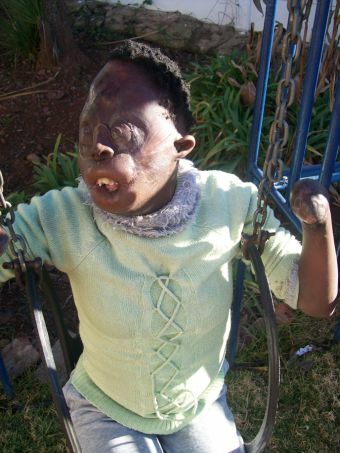 In December 1997 the doctors charged with Dorah's wellbeing intended to remove her eyes, because they said she was blind. And because the dressings used to protect them were deemed too expensive. This decision - and the ability of caring individuals to overturn the decision and to save Dorah's eyesight to some degree, led to an appeal published in The Times (UK). 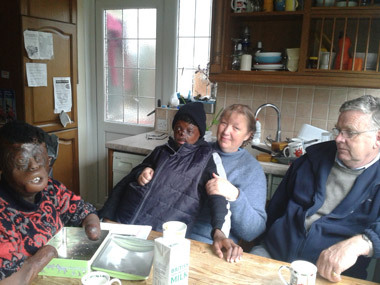 The formation of the Dorah Mokoena Charitable Trust in the United Kingdom and the Children of Fire Trust in South Africa followed as a result of the response of the public to Dorah's plight. Later the British charity evolved into Children of Fire International. 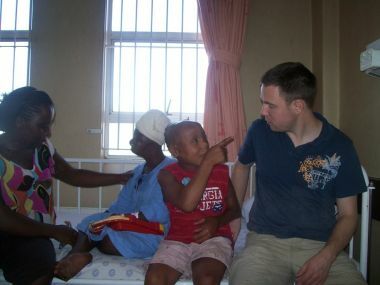 The charities assist each other to provide medical treatment, therapy and education for child survivors of burns injury and disability within Africa; proactively try to prevent burn injuries through education of largely Southern African communities; and inform people how to seek the swiftest and best-possible medical treatment for children who are burned. The charities expanded their work into acceptance and understanding of disfigurement as this became recognised as the hardest problem to live with as a burns survivor. In later years, public education increased in the United Kingdom and burns survivors from countries such as Taiwan and Norway got to visit Africa. All because of one brave little girl and the woman who championed her cause. Dorah's lips were made by John Clarke, a brilliant reconstructive surgeon at Chelsea and Westminster Hospital, London, UK, and previously at Roehampton. They are not flexible but they allow her to eat solid food, for her teeth to grow properly and allow her to speak a little. David Martin at the same hospital, opened one "hand" out of her right arm stump. Richard Collin at Moorfields Eye Hospital in London, (with anaesthetist Bernard Logan) gave Dorah "eyelids" that covered and preserved her eyes. David Gartry attempted a corneal graft at Moorfields Hospital - that procedure sadly failed. 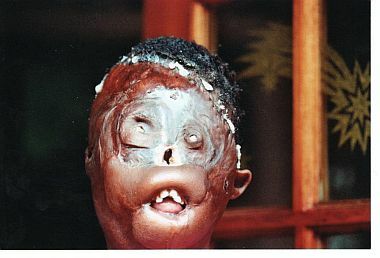 Colin Haylock of Charing Cross Hospital made Dorah's first prosthetic noses, later followed by Professor Peter Owen's team at the University of the Witwatersrand in Johannesburg including Leanne Sykes and Jamies Els; also Sarah Jones of Charing Cross Hospital and then Trevor Coward of Guys Hospital in London. After pursuing help at a surgeons' conference in Newport and to no avail at the Morriston Hospital in Swansea, Wales, the family set off for Yorkshire. Simon Kay and colleagues at St James' Hospital in Leeds were asked to try to create a thumb for Dorah. This might have been done by creating a forearm radial flap, where a cut is made into her right "hand" to make a cleft between the lowest thumb bone and the rest of the "hand". The cut would be lined with a flap of live skin, arteries, veins and all, from her forearm and might make a short mitten-like hand. If the process was deemed impossible, the alternative would be to cut a toe off from her near-perfect feet and transplant it onto the "hand". The odds were stacked against various procedures succeeding, particularly because the medical profession largely believed that Dorah could not learn to use a digit if she could not see it. But the odds have always been stacked against Dorah. She survived despite being on "managed care" (i.e. left to die gently). She learned to walk despite her South African medical team (Dr Leonard Potts) writing: "This child's legs are palsied, wasted. She will never walk." With inflexible lips, a very late start and it was thought, some damage to her hearing, she could nonetheless talk a little. So we hoped, regardless of the odds, that Dorah could get a working thumb that would allow her some independence and some privacy that would otherwise be denied to her for the rest of her life. After the leading doctor in Leeds made a decision not to help, largely based upon his interpretation of Dorah's intellectual capabilities, brave Bronwen and brave Dorah continued to look for help. Difficulties were compounded by the increasing number of other burned children and their parents clamoring at the door for advice from Bronwen - and there only being 24 hours in any one day. The previously-wonderful Chelsea and Westminster Hospital team no longer had the magic of John Clarke. While orthopaedic surgeon Max Horwitz seemed willing, others in the reconstructive fraternity put obstacles in the way. It was implied - contrary to the evidence in front of them - that Dorah would be difficult to anaesthetise. Quite frankly, if they had only accessed their own records (stored off site) from when she first had a series of operations at that hospital at about age four years old, they would have seen what a seasoned and resilient patient she was. There is something about the life-long-battle to help Dorah that can bring one into a head-on collision with some people. They may be overloaded in their day-to-day work and come across as abrupt or indifferent. They may simply not care. They far too frequently fail to understand that it is the weakest in society who actually need the most help. It is not a waste of resources or surgical skill or time to focus upon those who are most damaged by birth, accident or attack. If in 1998 we had known what we - the Friends of Dorah - now know, we'd have pushed far far harder at every obstacle that we encountered - but we relied far too much upon human decency, ethics and professionalism without understanding some of the broader dynamics at play which include deep prejudice. In our quest to locate surgeon Jagdeep Nanchahal - who'd been off to Australia and back in the intervening years - and after insisting (for by now dual-nationality Dorah) upon a second opinion when certain surgeons just said "No" - we got to re-meet Abilash Jain who'd studied with John Clarke. He and his colleagues through Charing Cross Hospital and St Mary's Paddington, attempted to create a small thumb on Dorah's right hand. It was a step forward and we were grateful. But the outcome that we were seeking was not achieved, so we persisted in the quest for further advice and surgery. It certainly proved to doubters that general anaesthesia was not a problem though. Finally consultants Asit Khandwalla who had operated twice successfully upon other severely-burned children in our care, and Baljit Dheansa who had operated four times on burns youngsters in our care, agreed to a series of procedures for Dorah. And then, through brutal ignorance and prejudice, Social Services prevented Dorah from having any more surgery just because they could. That was the state of play in late 2018. There are willing surgeons with great expertise, but bureaucrats without medical degrees are able to put Dorah's life on hold. The effect upon her life, her family and so very many other burned children in need, has been devastating. Prejudice is the biggest obstacle to Dorah learning. We thought that this was more extreme in Africa than in the more affluent parts of the world, but everywhere it is a problem. South Africa's Department of Education, particularly in what became Dorah's home-province of Gauteng, treated her as a problem that the department wished would go away. Indeed the White Paper on Inclusion was a farce. Officials were offered information on delayed development through prolonged hospitalisation; the physical effects of major burns on development; possible reduction in hearing due to use of ototoxic antibiotics after severe injury; the manner in which effectively-blind children can learn; and our accumulated wisdom on multiple disability; and more. Their "solution" in December 2002 and again, when they revisited the topic following media pressure in March 2004, was to try to dump Dorah in an overcrowded institute for severely mentally-disabled children. We refused that option and had many other parents of disabled children wanting to join us in a Constitutional Court action against the government. 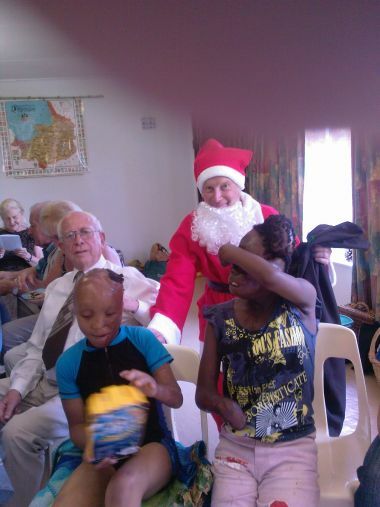 Ultimately, we had to choose to use our energy most effectively and so in 2003 set up the first School for the Blind in South Africa's largest city: Johannesburg. Part of the problem was political and that maybe was the hardest factor to overcome in a fledgling democracy. It was so hard for people who had hated each other for so long, to understand that some people's only motivation for helping an injured child, was love. A new charity evolved directly from Dorah's need for education. 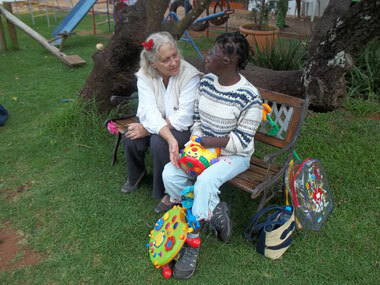 The Johannesburg School for Blind, Low Vision and Multiple Disability Children started in 2003. It received no government assistance at all until, finally, a small grant was received for just one (Grade R) teacher in 2016. Dorah can walk independently but when her vision deteriorated, so did her confidence. In the family home, she can find her way from room to room. She can walk up and down steps using a bannister, but where there is no railing or other human to hold, she crawls up and down steps instead. She is not entitled to a Guide Dog and white canes are hard to use with no fingers to hold them. She can jump a little and she likes to dance, mostly when holding on to someone else. She can climb up and down ladders, even up and down climbing walls, but she doesn't like going on the slide much. She swings very high, hanging on by her inner elbows, with enormous pleasure. She enjoys see-sawing with her elder brother and other children and she loves playing in warm swimming pools or the ocean - with active companions. She even enjoys exercise machines in public parks. Dorah can ride a bicycle when her more vigorous classmates in South Africa don't break the special thermoplastic "hand" rests and she can somersault. Trying to replicate this learning-and-exercise aid in the United Kingdom seemed a step too far for local imagination but we will persist. Dorah can drink by herself (she uses her tongue to seal the cup where her lower lip doesn't have the required flexibility) and she can eat by herself. She uses thermoplastic splints with a spoon or otherwise picks up the food with her arm stumps. It is messy but it works. Her drinking independence diminished after her wisdom teeth were removed in early 2018. Surgeons are willing to revisit her oral continence needs but not when beset by non-medical external influences. Dorah has clear preferences for high protein and high cost foods. She likes smoked oysters and smoked salmon and almost every fruit. She prefers chicken to potato; cheese to bread. She will feel the different ingredients of a meal and push the carbohydrate on the plate to one side. She does not like over-sweet cakes and sweets but used to be quite a fan of takeaways. She rarely eats those now in adulthood. As we came to understand what a high dental caries risk she would be with an ever-open mouth, we minimised added sugar in all aspects of her diet. As such, thanks especially to early dental assistance from Professor Sid Setzer of Johannesburg's University of the Witwatersrand, Dorah managed to reach her first quarter century without even one dental filling. This is not just praiseworthy but also pragmatic, because every bout of general anaesthesia carries risk (and cost) with it and Dorah would not tolerate a dentist giving her a tooth filling if she was wide awake - so her loving family decided it was best to avoid ever having a filling at all, if possible. Dorah can repeat the whole alphabet, numbers up to 21 and some months in order. It is not clear whether she sees a purpose to this aspect of learning though. Dorah used to sing favourite songs by tune only (Happy Birthday; Frere Jacques; Away in a Manger; Twinkle Twinkle Little Star; If you're Happy and you know it... etc) but sometimes vocalised the words as well. At first it was just "yappy (i.e. happy), yappy, yappy" to the tune of "If you're Happy and you know it" and then, quite distinctly, the words of "Happy Birthday to You". Some songs were confusing. At a creche that she attended in Africa, they used to sing "Good Morning to You" to the tune of Happy Birthday. So we would greet Dorah "Good Morning" and she would start singing the "Happy Birthday" tune... and eventually we worked out why. Dorah loves church hymns, especially "Sing Hosanna to the King of Kings". She greets her brothers by name, asks us how we are, and answers "fine" if we ask how she is. She tells us that she loves us, and she bids us Bye Bye (sometimes Ta Ta) or Night Night as appropriate. She can nod her head and say Ya for Yes but seemed before not to accurately hear the S in "yes". She used Makaton sign language for "more" combined with the spoken word; the same for "finished". Her understood vocabulary is vast but her spoken vocabulary that we can clearly hear, is maybe no more than 500 words. Dorah speaks very quietly, right in the back of her throat. She "clicks" to indicate she needs to go to the lavatory and can throw a tantum of frustration if she smells a delicious food and isn't given any. She is a friendly young woman when people are friendly to her. If she wasn't a hefty 50kg she'd probably still like people to pick her up as they did when she was a child - and thoroughly enjoys energetic dancing and exercise with someone trustworthy to lean upon. She is sometimes consciously naughty and often, for those of us who know her well, very funny and mischievous too. Dorah is aware of her body damage and that other people find her shocking to look at. Sometimes she is sad about it. One time in mid-2018 three insensitive officials stood extremely close to her and stared, oblivious to her need for personal space. Dorah's body language was such that she drew her shoulders in at the misery of being their Zoo spectacle. Is it that they know not what they do? Or to be blunt, is it that they do not care how offensive they are? 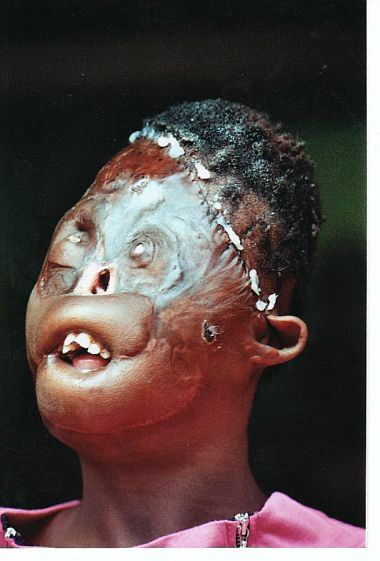 Just sometimes in Africa, when there are too many other burned children visiting, Dorah might demonstrate jealousy if they get too much attention. But because she is part of a functioning family, complete with boisterous dogs and her own possessions, territory, and routine, she is well-balanced. Dorah is a normal young woman, against the World's expectations. Our commitment to Dorah is to see her through her operations, which we had hoped would mostly be concluded within her childhood. Other people who have had severe burns or similar deformities to those that Dorah has, have had operations spread over many many years, because some aspects cannot be rushed and because the body and the mind need to rest and build between operations. Our extra impediments are money and time. The charity that started around Dorah, has grown. There are huge numbers of burned children in need and each extra one that is helped can, sadly, detract from the time, money and attention that Dorah also needs. Rich or famous people with severe burns, often have between 100 and 200 operations. That does not happen for children burned in the Developing World. The hands-on work to help Dorah was largely carried out by one woman and her son, seven days a week for more than 20 years. Needs were vast and resources few. Burns survivors who are forever in hospital fall behind on schooling, normal development and social interaction / family life. Most people, who are injured during childhood or born with deformities, continue to have operations well into their adult life. Dorah's medical timescale was a total guess at the beginning as the surgeons involved did not want to commit themselves far ahead; they are terribly aware of the potential for many a slip twixt cup and lip. Fourth birthday - April 12th 1998 Eyelid reconstruction completed at Moorfields, London. During late 1998 - Reconstruction of lips Roehampton/Chelsea and Westminster. Age five - late1999 - corneal graft and cataract removal on right eye; improving shape of lips. Age six - 2000 - More work on the space between gums and lips to improve oral continence i.e. to decrease dribbling. Age seven - nine. 2001 - 2003 no surgery. Many discussions with surgeons and requests for help from Swansea to Sydney, London to Leeds. Focus upon stability in her family life as her biological mother had abused and abandoned her again. Dorah was placed with trustee Bronwen Jones under a Place of Safety Order, then a Foster Care Order and later became a permanent member of her family. On a visit to the British Association of Plastic Surgeon's annual congress in Newport, Wales, a few surgeons agreed to see Dorah and others refused to. Assessment at the Morriston Hospital, Swansea. Age ten - 2004 In April 2004 Dorah met Simon Kay of St James' Hospital in Leeds, Yorkshire, UK. The quest was for a thumb. We anticipated surgery might take place in July 2004. It did not. Our knowledge grew in leaps and bounds. The number of children seeking help, soared. No matter how many staff or volunteers or interns we trained, the workload always exceeded them. Malicious damage harmed our endeavours. We overcame defamation. We won court battles, We persisted. But helping the most dysfunctional families whose children were injured through negligence or violence, was never going to get easier. Dorah had successful tissue expansion to improve her hairline and to protect her calvarial defect. One can elect to make a saline-filled bag expand under certain areas of skin to stretch it and to move hair-bearing skin to other areas of the scalp. Doctors and other specialists continued to misdiagnose e.g. 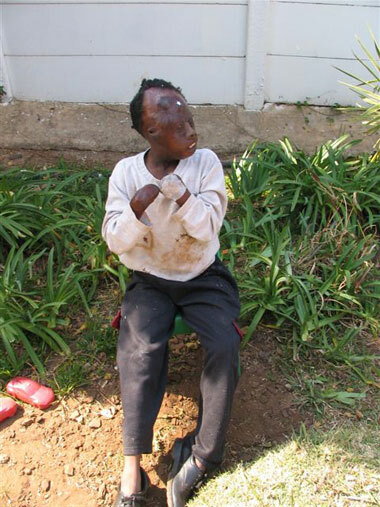 a Johannesburg paediatrician misinterpreted Dorah's skull dimensions as being congenital instead of due to the severity of 4th degree burns. A problem with delaying moving skin was that while Dorah's skull was growing in a better shape than before, it was still not growing in the correct proportions. 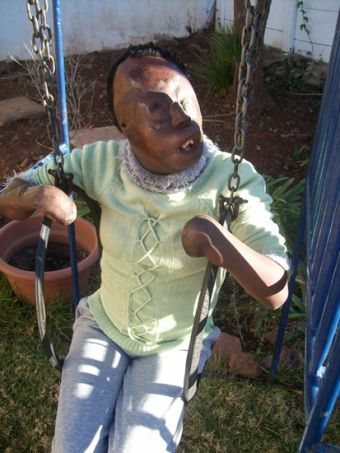 Every year skin / tissue movement was delayed, her head grew more deformed and much of that was irreversible. It was compensating for areas of permanent bone damage and tightness (all around the nose region, the forehead, and the stretched deformed ears) by growing disproportionately in other areas. The lip work in 1998 has allowed Dorah's jaw to start to move towards its proper alignment but she will never be able to fully close her mouth. Would that the first hospitals had not turned her away. Would that the first admitting hospital had assumed that she would live and brought in global expertise right from the beginning. Maybe Dorah survived so that medical specialists could be reminded that the strength of human spirit can always surprise us? 2004 did not bring a right-hand thumb solution. Not even prosthetic thumb implants. Dorah seemed at that time to be left "handed". It is not known if this is how she would have developed if she had never been burned. It may be that of both the injured arm stumps, the left one was simply easier to use. It would have been good to open the left stump and create something more useful from the melange of bones that is there…. but no surgeon ever agreed and now it is too late. All child amputees have bones that continue to grow, nearly always faster than the damaged skin can keep up. Sometimes bare bone protrudes through the skin. There are times when the limbs are sore or even very painful. Living in Johannesburg, 2000 metres above sea level, the short-but-harsh winters are bitterly cold and dry. These factors combined, can lead to Dorah's hand stumps bursting open and bleeding. We hoped that Dorah's link with Leeds would make this pain a thing of the past but 14 years later we were still battling on without the outcome that we had sought. Surgeons were onside but other people then put obstacles in the way. Dorah lost the vision in her right eye after infection following the corneal graft. We had not been adequately forewarned about the costs of the anti-rejection medicine nor had it been made clear how hard the one-drop-every-single-hour administration would be outside the hospital setting. Staying inside hospital as a foreigner was at a prohibitively-expensive day rate. Staying then at the Geary family home instead, (as Dorah's biological mother did not help at all), the humanly-impossible drug administration regimen fell solely on Bronwen's shoulders. She persisted and for a while, Dorah's improved vision was noticed. But after Bronwen returned to look after her numerous other burned children, the biological mother failed to comply with doctors' instructions - even though the process was no longer required every hour. So the graft failed and the potential for eyesight on that side was lost forever. An orthodontokeratoprosthesis to place a lens within Dorah's left eye using part of a relative's jawbone and /or eye teeth or part of one of Dorah's own bones, could still give her left eye a chance to see. (Christopher Liu pioneered this surgery in the UK but the best person in the field was in Italy; the best person in skull bone replacement was a Bulgarian professor, Dorina Krastinova, in Paris, France). If surgery was carried out to Dorah's left eye and failed though, she would lose the sense of light and dark to which her diurnal body rhythms are set. Her adoptive mother still hopes beyond hope for a stress-free six months where she could investigate such surgical options. The chance of putting muscles into Dorah's eyelids is extremely slim. No one has yet rebuilt working eyelids. The remarkable two-sided skin of the eyelid is not readily replicated in the body - but for male burns survivors, they could use their own foreskin to graft into an eyelid in some cases. Dorah has not had chest surgery which we had hoped for when she was younger. In the future there are many areas of function or even aesthetics that could improve Dorah's quality of life. But the political and economic problems in South Africa and the austerity and Brexit-damage to the economy in the United Kingdom, mean that there is less chance than we had once hoped. We now know who the best surgeons are and where the best facilities are. But politics and prejudice beset Dorah and those who know her best and love her most. All trustees and supporters are advised to read the considerable amount of text on the burns survivors' websites (some are cross referenced to our own site). It would then be clear to them that the operations will have to continue for a long time but can decrease in frequency over the next couple of decades. The sorts of aspects that are of great emotional importance to people with damaged faces are to be able to smile when they want to. And to be able to have normal facial features like eyebrows. Dorah has no eyebrows. One adult male who fell into a fire when he was camping, lost his eyebrows. He was operated on to move hair into the eyebrow region, because this feature was important to him. What he hadn't realised was that his new eyebrows were of a different sort of Caucasian hair that grows rapidly like the hair on one's scalp and so he will have to cut his eyebrows every single day for the rest of his life. Dorah did not have a normal hairline, but we improved it through tissue expansion. She will not be given eyebrows and further scalp alteration is unlikely. The calvarial defect remains and as we took increasing numbers of burns survivors into our care who in some cases had much larger bony deficits, the urgency to deal with hers became less. We did, through scalp expansion, improve the skin cover there. Dorah needs her pocket ear unfolded for hygiene and the distorted ear's shape improved. Dorah needs essential repeated surgery on her hand stump/s. Dorah must have her oral commissure re-tightened as post wisdom teeth removal due to pain, she has lost oral continence and some level of independence that she had before. 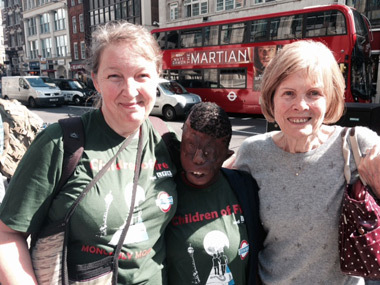 Her mother and brother even met with Professor Laurent Lantieri in Paris to talk about face transplants. No further surgery will take place until unfounded and destructive intervention ceases. That began in 2018 but it is not known when it will end.